There is an Australian television series that is currently being broadcast on one of the internet streaming services called 800 Words. The plot is straight forward where an Australian writer moves his family from Sydney to a remote town in New Zealand. In Sydney he wrote a weekly column for a prominent Sydney publication that always contained exactly 800 words. He continued the tradition in New Zealand and a significant undercurrent of the show’s weekly plot was his struggle to find the right topic for his weekly column. Of course, that struggle was inevitably tied to the ongoing plot lines in the series. As in everything in fictional television, he succeeded. Such success is not so easy I find for the blog writer. Especially when writing about topics related to fly fishing. Being blessed with living in SW Montana, having access to dozens of world class angling opportunities, being a seasoned angler and fly tier, one might think that I’d never run out of topics to write about. Ah! But such is not the case. Thoughts for the next blog post usually come while I am on the water or to and from whatever destination I am fishing that day. As most of my angling is a lone affair, I have lot of time to think. Sometimes settling on a blog topic is a long time coming. But once I think I’ve found one, I do a lot of writing in my head. This can be problematic because I don’t always remember what I wrote (in my head) once I get to the computer. The real challenge however as the months go by are getting hold of those topics that might prove interesting to the readers while conveying at least something that might be useful. Also, making sure the topic hasn’t already been covered. Even when interesting topics bubble to the top, there’s the issue of images. Posts are enhanced by images, so being able to garner some or tap into previous work makes selecting a topic easier. So, as I was thinking about this, a lot of potential blog topics came to mind. Of course, for a blog on a fly-tying materials site, posts about the latest new killer fly creation are obvious. Lots of images required for these, but the permutations of combinations of materials that can crafted on to a hook or a tube are essentially infinite. We could have the fly of the week or of the day if we tried. I do find posts directly related to the use of specific materials very interesting, especially if they are exotic or outside the mainstream. One of our local fly shops was selling Shunk masks he got from a local trapper. I could probably create a fly called the “Odorous Nymph” if I had one of those masks. The scientific analysis of the pro and cons of any material can make for interesting reading if you care about that. Angling gear can be an interesting topic. Rods, reels, lines, leaders, knots, etc. can also be subject to scientific analysis of the pro and cons, but “I really like to fish with my 5 weight Sage XP” doesn’t come close to 800 words, so I have written about it yet. Fishing destination related posts are my favorite. I like to write about where I’ve been and enjoy reading about where others have been as well. Equally interesting is the history surrounding angling destinations and how understanding that history adds to the angling experience. Since I live in Salmonid land, writing about the various trout we have, their behaviors and how to catch them is rather easy, but once you’ve cycled through the list of available species, topic selection gets more difficult. If I was still in the south, there’d be a dozen more species of sunfish, bass, catfish, gar, and stripped basses to talk about. The whole range of topics surrounding angling techniques—casting styles, reading water, fly selection and presentation offers a lot of room for innovative and useful posts. I would enjoying writing more about reading water, but such posts require lots of images to explain a lot of confusing vocabulary. Plus, pronouncing that where the fish are in my streams are where the fish will be your streams seems a bit presumptuous. I am sure there are more generic topics that can be added to this list—angling communities and associations, angling humor, literature, personalities etc., but I needed to get started on my topic for this post—cannibals. The day prior to a recent trip, I saw a news article online that suggested cannibalism was still practiced by some remote tribes somewhere in the hinterlands. 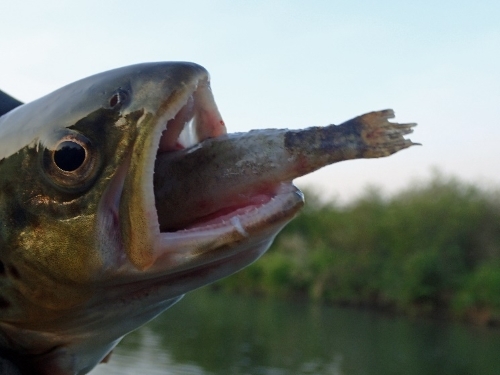 That prompted me to think about writing about my favorite cannibals—trout. Voracious cannibals they are. But alas, I came to my 800 words before I could write much detail about it. This entry was posted in Fly Fishing Life, Mike Cline, Bozeman MT, Our Regular Contributors and tagged fly fishing, fly fishing life, fly fishing writing, Montana fly fishing on October 24, 2018 by Mike Cline. Funny, as I saw two remarkable incidents of trout cannibalism on the river this summer and was “writing that blog in my head”. Hope all is well. Dang it Mike, a more blatant bait-and-switch I’ve never seen in my life. Such a cheap trick…we’re all left with a great cannibalism photo in our heads and no wild story to go with it. You should be ashamed of yourself. PS. Sorry to use the dirty word “bait” on this forum.